The flagship of Russia’s Pacific Fleet, Varyag, and the country’s most powerful nuclear-powered battleship, Pyotr Veliky, entered the Mediterranean Sea on Saturday. The crew of 'aircraft carrier killer' Varyag will carry out a number of tasks, some of which will be performed together with the joint group of Russian Navy ships and vessels stationed in the region, Roman Martov, press secretary for Russia’s Pacific Fleet, told Interfax news agency. 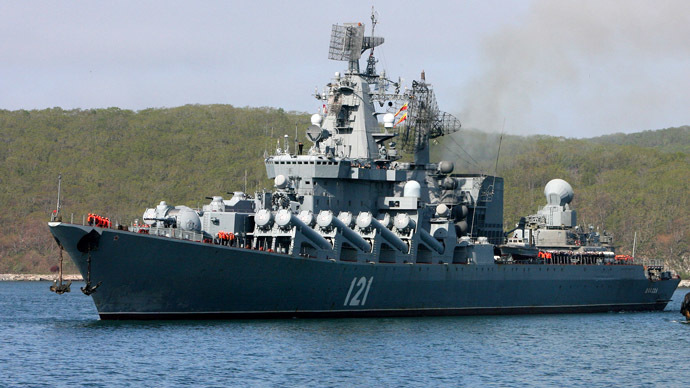 Varyag is to assume the command of Russia’s Pacific Fleet in the Mediterranean Sea, replacing missile cruiser Moskva, said Interfax’s military diplomatic source. He added that there are detachments of marine units employed on ships and vessels of the Pacific Fleet, while its air force wing boasts several Ka-27 helicopters that can conduct rescue and anti-piracy operations and kill submarines. 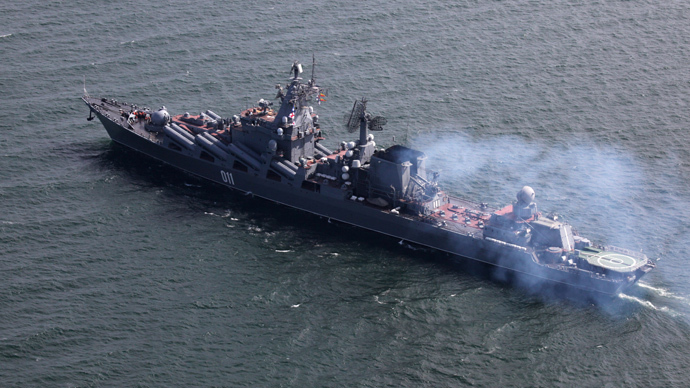 Varyag belongs to Slava-class cruisers (according to NATO classification). Completed in 1989 and operating in the Russian Pacific Ocean Fleet since 1990, it has: 16x P-1000 Vulkan anti-ship missiles, 2x RBU-6000 anti-submarine mortars, 8x8 S-300PMU Favorit (SA-N-6 Grumble) long-range surface-to-air missiles, 1x twin AK-130 130mm, 6x AK-630, 2x OSA-MA (SA-N-4 Gecko) SR SAM installations, 8x SA-N-6 Grumble. Russia’s most powerful battleship and the flagship of the Northern Fleet, Pyotr Veliky (Peter the Great), passed through the Strait of Gibraltar and anchored in the Alboran Sea on November 2. The warship that left the Northern Fleet's main base in Severomorsk on October 22 managed to cross the northeastern Atlantic despite stormy weather conditions. The crew successfully conducted dozens of exercises, including air defense and anti-submarine training. The cruiser logged over 3,200 nautical miles during the trip. 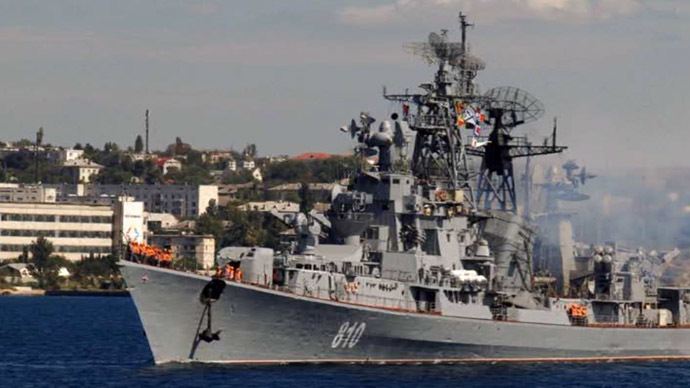 Viktor Chirkov, admiral of the fleet, said in September that the Russia Navy is set to build its presence in the Mediterranean Sea, particularly in the area close to Syrian shores. It intends to increase its number of battleships in the area by up to ten. Russia began its military build-up in the region in December 2012, establishing a constant presence in the Mediterranean Sea.